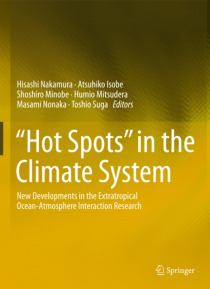 This book consists of the articles from thespecial issue of "e;'Hot Spots' in the Climate System"e; in the�Journal of Oceanography,Vol. 71 No. 5, 2015, comprising 9 chapters that cover a wide spectrum oftopics. This spinoff book is a collection of papers on the scientific outcomesof a nationwide 5-year project funded by the Japanese Ministry of Education,Culture, Sports, Science and Techno… logy (MEXT) and known internationally as the"e;Hot-Spot Project. "e; The academic achievement of the project has gainedinternational recognition, making substantial contribution to unveiling theclimatic role of warm western boundary ocean currents, including the Kuroshio,and associated oceanic fronts characterized by sharp temperature gradients andactive meso-scale oceanic eddies. Specifically, those warm currents may becalled "e;hot spots"e; in the climate system, as they intensively release heat andmoisture to the atmosphere, thereby acting to organize clouds and precipitationsystems and set conditions favorable for recurrent development of storms. Thisspinoff is a unique collection of the outcome of the particular project. Thecollected papers cover a wide range of aspects of ocean-atmosphere interactioncharacteristic of the oceanic fronts and continental marginal seas, unveiledthrough observational, theoretical, analytical, and numerical investigations. Most of the readers of the book are assumed to be researchers and graduatestudents who study climate dynamics, physical oceanography, atmosphericscience, and air-sea interaction.